DN : 12.5 ~ 32 mm. 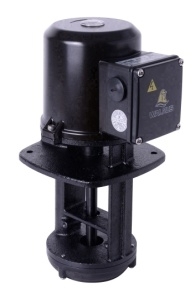 Head : up to 12 m.
Features: The pump is one-chamber vertical centrifugal pump, co-axial pump/motor design, impellers mounted on extended motor shaft. Application: The TPAK coolant pump is design for the circulation and spraying of cooling lubricants, especially for machine tools. This series may use on all machine tools performing turning, milling, drilling, cutting, slitting, grinding etc. operation. It is suitable to carry liquids such as water, coolant, light oil and other clean, non aggressive matters.